Ruin Lust seemed like an interesting concept for an exhibition – a survey of art focusing on ruins. It’s an interesting exhibition looking at ruins in painting, drawing and photography along with (to a lesser degree) film, sculpture and literature. 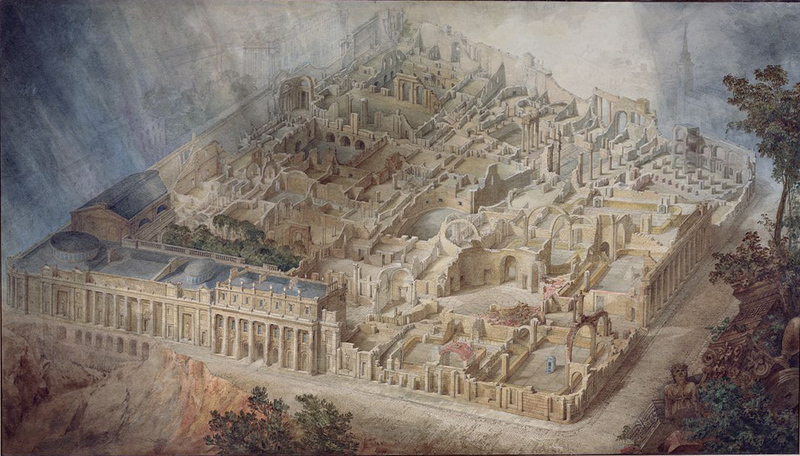 The variety of ruins featured runs from castles to abbeys to imagined vistas of destroyed London to bunkers to housing estates to a bizarre flight of three steps all alone in a field. The variety of work on show is excellent. While I don’t want to pick and choose from amongst the pieces I really like Joseph Michael Gandy’s A Bird’s Eye View of the Bank of England (1830). I can’t help thinking that a tighter integration of the literary element alongside the art could have added interest. It’s the reverse problem I have with British Library exhibitions where going past the words and in to broader art can liven up an exhibition. Here a few well chosen quotes could give context to the art in a broader way. Instead the main literary element is a film recording of actors reading from science fiction authors (1984 and beyond) which at 60 minutes long is a bit of a challenge to sit through at the end of an exhibition. The other (maybe obvious) omission is any mention of archaeology and its associated art which has since Time Team made it cool been very much tied in with our view of ruins often so far gone as to be lost beneath the ground. That said the exhibition does manage to cram quite a lot in while not leaving me exhausted as Tate’s Water Colour exhibition or the RA’s Bronze. The rooms have reasonably clear themes and the presentation of the works is structured rather than just a random assembly of pictures or an arbitrarily enforced chronological survey. It did suffer from a few of what I’ll call my usual grumbles about exhibitions. The text for several pieces grouped together requiring a bit of simple detective work to identify which text goes with which picture. The use of a rather small font that anyone without perfect eyesight will struggle with. Putting the text for a work in a corner making it hard for more than one person to read at once. Where there are video and audio pieces a simple indication of duration and some way of knowing if you’ve arrived half way through would be nice. So if you’re interested in 200+ years of art of and about ruins Ruin Lust is worth a look.